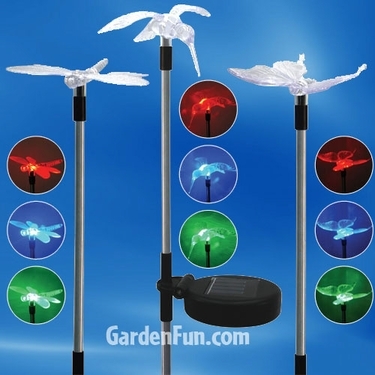 Your garden will soar with style when you add our set of three Flying Friends Solar Garden Stakes from GardenFun! Place them throughout your yard to create a custom array of solar yard decorations. Each set contains one solar butterfly garden stake, one solar dragonfly garden stake and one solar hummingbird garden stake. They appear clear during the day, but at night, each one has a solar-powered, multi-color LED light that rotates from red to green to blue for a colorful display. Add them to your garden, yard, balcony or porch for a beautiful outdoor decor theme. Each metal stake stands either 22" or 31" depending if you use the optional 9" extension rod. With two heights, and your choice of how how deep you like to place them into the ground, these solar garden lights will entertain at different heights all over your lawn, garden, yard, porch, balcony and pathways! Durable plastic flying fiends, metal garden stakes. Great for lighting your garden or walkway, adds fun to any outdoor setting! Includes rechargeable batteries for solar panel; charges by day. A fun solar garden lights garden gift!